4. Direct to consumer genetic testing—buyer beware! 6. 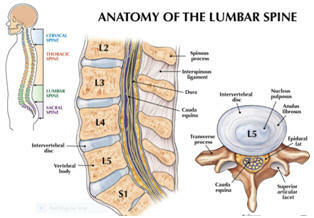 Lumbar Spinal Surgery with laminectomy and without spinal fusion? New studies give some answers—it could be a game changer! Did you know? Only 6% of physicians were sued from the years 2005-2014 (sample 900,000 physicians), and only 1% of that group was sued more than once. About one claim in an entire physician’s career is usual. Still, defensive medicine continues to drive up the cost of our healthcare. We need legal reform just as badly as healthcare reform!!! It is called the Practice of Medicine for a reason. No one can be perfect. Cancer Fund of America and Cancer Support Services, Inc.
Be very careful to check out a charity before donating!!! Last month, I reviewed some of the bullet points Mr. Trump has on his website. In great contrast, Bernie Sanders proposes a form of Medicare for all—a form of socialized medicine, but that doesn’t make it free. All Medicare recipients are paying more and more for healthcare. Does Sanders expect taxes to pay for Medicare costs for all? NO! Obamacare health plan has helped 15% and hurt 27% of Americans according to recent reports from our government. The premiums, to stay reasonable, are raising deductibles and co-pays as United Health Insurance Company (the biggest insurance company in America) will get out of exchanges in 2017. This will create, in some states, just one other insurance choice, and you know that will bring higher costs. 1. It imposes 6.7% payroll tax on all employees; 2.2% tax on individual incomes less than $200K for singles and $250K for joint incomes. That means those making more than $250K would contribute $117 billion to the single payer system. Critics say it will take 11.7% payroll tax with a sliding income tax of 0-9.5% depending on a person’s income to cover the costs of universal healthcare. 2. Instead of paying an insurance premium, those who make less than $50K (median income for family) will pay $1100 in healthcare costs compared to the average of $3855 plus out of pocket expenses for an average insurance premium. Kaiser Permanente estimates $4955 for the average cost of current health plans. 3. Employers will pay $3350 for family coverage per employee—much less than $12,591 currently spending. The 6.7% payroll tax will come out of the worker’s paycheck. Sanders has stated it will save the average family $505-1823 a year. 4. This system has a shortfall of $599 billion which Mr. Sanders says can be made up by “trimming costs”. This system would reduce administrative expenses considerably, but it requires reduction in doctor incomes and hospital profits greatly. Experts say it would require 42-47% “trimming”, which is unrealistic (Sherry Gliad-professor of economics at NYU). 5. Sanders goes beyond current Medicare benefits and includes vision, dental, hearing, and long term care plans. Sure sounds good!! This is in contrast to the capitalistic type of medical care we have today. Clearly, a one-payer system is far simpler, but it assumes a major cost-shifting to those more affluent Americans (the upper 5%-income greater than $150K) but in fact takes money away from the middle class too. Flooding the borders with immigrants has muddied the water in deciding whether this socialized system will work in our country. Refugees are even getting Social Security checks. No doubt, a major portion of our medical system is already being paid for by the government, but there has been major abuse of that system with Medicare and Medicaid, including the incredible VA mismanagement of beloved veterans. Yet the cost of healthcare continues to rise and without controlling insurance companies from charging more and more for premium, deductibles, and co-pays is a problem (welcome to a capitalistic society). Interestingly, the fact that actual medical costs must amount to 85% of the income of insurance companies, so they have to make their 15% increase in multiple ways. Big Pharma is out of control as well. The abuse by so many Americans regarding their health is a huge problem facing a system that will break eventually unless reform occurs or we are taxed heavily to pay for any system. None of the candidates’ health plans have been clearly laid out (except Hillary’s which continuing the status quo). It depends on who you believe when talking about healthcare, quality, access, physician acceptance of the system, choosing your own doctor, narrowing networks, access to specialty centers (i.e. MD Anderson, Sloan-Kettering), etc. Routine care is not the issue. When someone has a more complicated health issue, or a rare condition treated best in certain centers, will those patients be able to access them? We all agree the cost is out of control, but so is the appetite of the American healthcare consumer. We are spoiled to death. Look at the countries that have socialized medicine. Canada does not cover medicines in their socialized system and services are limited. The wait for specialized tests is long. Socialized systems can’t have it both ways. Rationing and cutting corners is just going to have to happen. Yet, we must keep an open mind to alternatives to our current system, which has tremendous fraud, abuse, and is tainted by special interest groups and lobbyists who contaminate our Congressmen daily. Did you see the Sunday show 60 Minutes this week about a mandatory 4 hours a day that Congressmen must work on fund raising (cold calling their constituents) instead of doing their jobs)? They are required to raise $18,000 per day. Federal contracts are given to select companies that have ties to our government officials, which costs us billions. Contracts for our military are severely abused by those in power. Look at what is happening with the popularity of the “outsider” candidates”. People are fed up with our system of government. The working American is sick and tired of being abused. Will the poor be treated equally in a socialized system? What are WE giving up for “everyone” to have medical coverage free? There is no FREE!! Somebody is going to pay, and Bernie thinks there are enough rich people to take care of the rest without costing the middle class more. We have a country that is in crisis, and will the quality of care for you and me suffer when everyone has equal access, care, and quality of care? I predict it has already started! Healthcare is well over $2 trillion dollars now and with Bernie’s plan, you can add another $1.5 trillion. No candidate can convince me we will save money without interfering with quality of care, access, and continued advances in research. A new study states that federal, state, and local taxes pay for 64.3% of healthcare or $1.877 trillion in 2013. The author is David Himmelstein, M.D., a public health professor at a university in NYC, says that Bernie’s plan will only rise to 67.1% by 2024 (American Journal of Public Health). In contrast, The Centers for Medicare and Medicaid Services state that the government pays for only 43% in 2013. The feds explain the difference in Himmelstein’s figures due to the taxes lost in exclusions by the private health insurance companies. Calculations can be manipulated, so until other independent groups can substantiate those figures, common sense just doesn’t follow that there would only be an increase of 4-5% in overall cost to have Medicare for all. There is no question dissolving the insurance industry would be devastating to thousands of American workers. Cancelling an industry will have a great negative effect. There is always a downside to elimination of any industry. However, most countries that have socialized medicine have a two-tiered system and those who can afford it will certainly buy secondary insurance to cover the major items that will be excluded by any socialized system. So the cost to most of us will be much higher than Bernie thinks if many of us are paying for the socialized system and a backup plan. It should be noted that free medicines are not included in Bernie’s plan as it is in Canada! As we know there is considerable cost for Medicare as it currently exists. Bernie does not say anything about deductibles and co-pays. That puts the poor right back in the same place they are now…..not being able to afford them. Sanders claims that his plan will save $10 trillion over 10 years in healthcare costs. There is no way to cut administrative cost, reduce fraud, and reduce payment to Big Pharma to cover that claim. We must wait for even more information on this subject. There is no discussion in Sanders plan about quality and access to care. This is very scary!! Will any Congress will pass his plan? Not covering drugs is a huge drawback and his plan like the rest is vague and will be totally negotiable with Congress and Big Pharma. Who in their right mind thinks that Medicare as we know it will remain the same in a Medicare-For-All Plan? Reform means rationing in any system that declares healthcare will be less costly. Where is the legal reform in any of these plans? Read Physicians for a National Healthcare plan if you want to dive into a one payer complicated plan and read what we are giving up to cover every person in this country including every refugee and immigrant that passes through our borders. Providing a single payer system has its advantages in that it covers basic medical care, urgent, emergency, and catastrophic care, but what about chronic care, non-urgent care, and surgeries to improve quality of life (i.e. joint replacements, vascular surgery to prevent rather than treat cardiovascular illness). These folks are planning to cut 20% of healthcare because it is deemed unnecessary by a bunch of bureaucrats. What can make sense is transitioning care to groups of patients over time. Reform is necessary, drug costs must be reduced, and unnecessary care must be more limited. The X factor is patient responsibility!! How we define these issues will take years, but should be done. The Congress could have done that with Obamacare, however, the political parties would not work together. Next month, we will look at Ted Cruz’s healthcare plan. Anyone who has had chicken pox is at risk to develop the same virus sometime in their life. Fortunately, there is a very successful vaccine that will either prevent the disease or keep from creating serious complications. It is recommended the vaccine should be taken by age 50. 1 million Americans develop shingles each year!! 1. Pre-eruptive—this phase is characterized by pain in specific areas of the body defined as dermatomes. A dermatome is the area of skin innervated by a specific sensory nerve (see drawing above). The nerves are paired! When a rash is seen in a particular distribution that follows these dermatomes, chances are very good it is herpes zoster virus (chicken pox virus) or herpes simplex virus (fever blisters-oral and genital). 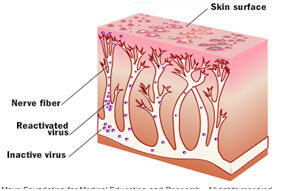 The virus lives in the cell body of a nerve (see drawing above) and when it is activated, it travels up that nerve to the skin where it creates blisters. During the pre-eruptive phase, symptoms include hypersensitivity and itching of the skin. 2. Eruptive Phase—a patchy red rash proceeding to blisters with severe pain with or without swelling in the neighboring lymph nodes. The rash lasts 10-15 days up to a month for complete healing. 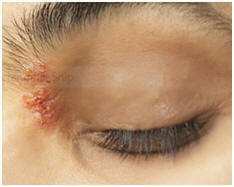 Scarring can occur especially with secondary infection. The pain usually subsides with resolution of the rash, although if pain persists, this can be permanent (post-herpetic neuralgia). This can involve the eye causing severe pain and visual loss (herpes ophthalmicus) and is more likely to become chronic. The facial nerve, if involved, can cause facial paralysis and involves the external ear (Ramsey-Hunt Syndrome). The most common area to erupt is on the skin over the ribs stretching around the body on one side. 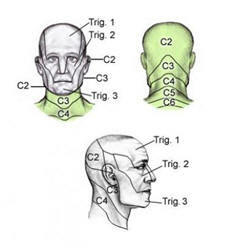 It can also occur in the distribution of the trigeminal nerve of the face or near the ear (as shown in the photo above). It can mimic headache, pleurisy, sciatica, cardiac, or abdominal pain. Symptoms include fatigue, muscle pain, headache, sensitivity to light (photophobia), and rarely fever. This phase can last 1-10 days and without a rash. Clothing touching the skin or even the slightest touch is very painful. 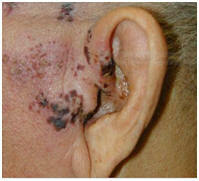 Below are examples of shingles affecting the trigeminal nerve around the eye and the ear in the first 2 photos. The third photo shows the rash over the ribs. 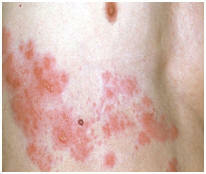 The word “shingles” comes from the Latin and French word meaning belt or girdle based on the distribution of the rash. 3. Chronic Phase—9-45% of the cases can proceed to this phase defined as pain after 1 month with the pain confined to the specific dermatome distribution. This post-herpetic neuralgia can last months or years. Post-herpetic neuralagia occurs more frequently in older patients, who are immunosuppressed or who have other chronic illnesses (diabetes, cancer, etc.). Treatment includes, lidocaine skin patches, capsacin patches, specific nerve pain drugs, i.e.-gabapentin (Neurontin), pregabalin (Lyrica), and antidepressants that also help pain such as Cymbalta, Pamelor, or Effexor. Epidural injections using cortisone are used in some cases. In extreme cases, nerve destruction can be performed by pain management specialists. Botox more recently has been used to ease the pain in patients with shingles. A known risk factor for developing shingles is inflammatory bowel disease (use of corticosteroids), immune suppressive medications including chemotherapy, and chronic illness. There is a 70% increased risk for patients with asthma in adults. This may include patients with atopic illnesses (those with allergies). These groups should be vaccinated. Talk to your doctor! An antibody test can confirm the diagnosis, but the clinical picture is usually all that is needed. The treatment includes high doses of acyclovir (Zovirax), famciclovir (Famvir), or valacyclovir (Valtrex). These antivirals can be given intravenously if admitted to the hospital. NSAIDs (Aleve, etc. 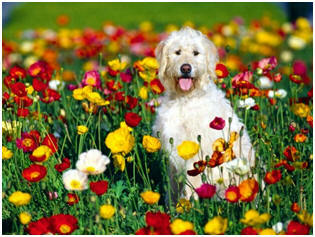 ), and narcotic pain medications are usually necessary. Treatment of the rash includes Burrow’s (vinegar) solution soaks intermittently with calamine lotion to dry the rash. There are creams containing these antivirals but systemic treatment is necessary. Eye involvement, severe symptoms, secondary bacterial infection in the rash, more extensive involvement (more than one dermatome), any person immunosuppressed, or has involvement of the brain (herpes encephalitis). Prevention is the name of the game. This vaccine is not intended to prevent chicken pox (varicella) or treat post-herpetic neuralgia. Its value comes from diminishing the severity of shingles and is particularly helpful to prevent post-herpetic neuralgia. Oncologists should consider giving this vaccine before cancer treatment is to begin, especially chemotherapy. Anyone with chronic illness is a strong candidate for this vaccine. If you are not sure if you ever had chicken pox, your doctor can test to see if you have antibodies in your blood. Shingles only happens in those who have been exposed to the chicken pox virus. This vaccine should not be administered to immunosuppressed patients, as the vaccine is a live virus and can cause disseminated varicella infection. This vaccine requires a prescription from your doctor, but can be administered by local pharmacies. Discuss this with your doctor. This discussion is long overdue. We all have to face this either with a family member or ourselves. Fortunately, there is finally evidence-based information to relay to you regarding this very important subject. In the last month of life, 1 in 2 Medicare patients visit an emergency department, 1 in 3 is admitted to an intensive care unit, and 1 in 5 have emergency or inpatient surgery. The sobering fact is that there are no policy or practice guidelines to insure improvement in quality of life for the millions of dying Americans. 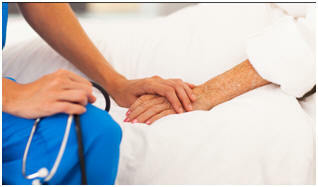 Currently end of life measures are costing us billions of dollars we can’t afford. Despite that there is little evidence that the current Physician Orders for Life Sustaining Treatment programs improve patient outcomes, and these well intentioned programs do not meet the minimum standards of care. This is such a hot button item, that politics and emotional decisions create an atmosphere that has created unnecessary over-management of issues that ought to be left to hospice. That is what you get with government intervention—more bureaucracy. Another problem is less than a third of doctors are trained to deal with end of life discussions. Some doctors are hung up on feeling that a discussion on end of life care implies “giving up” on their patient. This is clearly a problem doctors need to address by attending educational classes to overcome their barriers to initiating these very important discussions with patients and families. If patients want this conversation, I encourage them to bring up the issue. If a doctor isn’t comfortable, I recommend reaching out to the Social Services Department of a hospital, as social workers can be a big help. Families and even lawyers sway doctors to continue expensive care with no idea that it will help the patient. Abuse in using clinical trials does occur (the patient is clearly too far along to live long enough to see benefit). 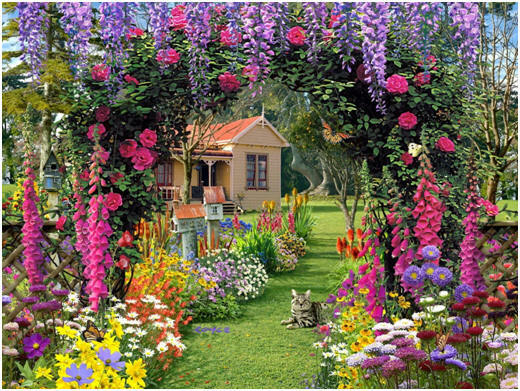 Doctor’s hands are frequently, because to deny apparent care is to go against everything a doctor is trained to do….help people. But, there is a time to say “No”. There is a time to say we are not here to make the family feel good….rather it is a time to make hard decisions and allow the inevitable to happen and provide dignity in death….because it is going to happen regardless!! There are more national initiatives designed to help this situation, and so far they have failed to provide convincing evidence that they are meeting goal. Finally in July 2015, CMS (Centers for Medicare and Medicaid Services) decided to reimburse doctors for discussions on advanced care directives. This was based on the premise that skilled communication with patients and their families would allow sound decision making in the best interest of the patient. In my mind, this discussion frequently comes too late, and I feel that it is better to start this discussion when the emotions are not so high. 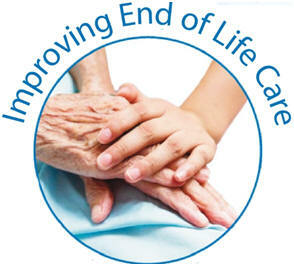 This is the way to improve end of life care. Because this will never be decided by doctors, patients, or families, sadly it is up to the federal government to intervene with guidelines that can be followed without recourse. It has come to this in a time when billions of dollars are unnecessarily being spent in the last month(s) of life. It may not cost as much as expected. Only 11% of the highest cost patients were in the last year of their life. Only 13% of the $1.6 trillion spent on healthcare is spent in that last year. Chronic disease conditions and disability conditions are where we must contain cost if we are ever going to have healthcare reform. 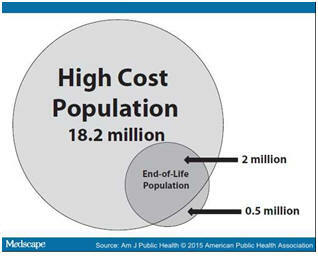 The above drawing shows that there 18.2 million people in the high cost category. Only 2 million are in the last year of life, and 0.5 million are not even in the high cost category. This group could be placed in a federal grant to lower the overall cost of healthcare. This has been proposed for Medicaid recipients by some Republican candidates. a) Patients who participate in advanced directives with care planning tend not to go to the ER as frequently and stay out of the hospital. The truth is that if such a patient goes to the ER, they are very likely going to be admitted forcing life saving measures that might not be in the best interest of the patient. b) It is currently being determined what measures of success should be used to determine value of care. Informed consent does not include end of life issues, only those regarding resuscitation and prolongation of life with artificial means (respirator, etc.). Pre-determining the wishes of the patient will help this process, but patients and their families can change their minds in the heat of the moment. Assessment of pain with consultation with palliative care physicians is becoming a desired approach. Aggressiveness of care in the end can be assessed by the treating physician(s), but must be accepted by the patient and family. The doctor must be careful not to unconsciously frame the options with personal bias. Research has shown bias. c) Openness to experimentation with models of care is absolutely necessary to determine how best to proceed in the future. Insurers, health systems, and the legal system must work together to allow this very important step. Testing different interventions will be the key to determining the best course of action in the future. Who will pay for this? Can we invest in this necessary experimentation to provide us with the evidence-based medicine we desperately need. Initially, 2 years ago the FDA was very concerned about the accuracy of this test, but apparently that concern has passed. They have over one million who have paid the $199 for the testing. A side bar event has occurred in that research companies have partnered with this company and created a huge data base to perform various epidemiological studies on it. It tests for 36 genetic different autosomal recessive diseases such as cystic fibrosis that could be passed down to their children. It is still being criticized by many because it does not have perfect accuracy, but it is affordable, which would not be the case if the medical companies were selling this. It would cost thousands of dollars. It apparently is not as valuable for Asians and Hispanics as it is for whites. No explanation is given. The biggest concern with any genetic testing is what a person does with the information. That is exactly why direct to consumer genetic testing creates fear, uncertainty, and an expert genetic counselor is absolutely necessary to decipher this delicate information. These counselors are experts on how to interpret the findings of the genetic testing and how to proceed. Who do you share this information with? Will it be safely kept in electronic medical records? How do you act on this genetic information? Clearly a person or family cannot go it alone. Besides DNA is only one of many factors regarding health issues. Most diseases may have genetic markers but environmental issues and social habits are just as important. 1) If you have a positive test for a genetic variant, it does not mean you will automatically get that specific disease. 3) This company started with 256 tests and is has narrowed to 36. What are the genetic tests? 9. Factor V clotting deficiency-thrombophilia-a disease that increases clotting and DVT. This is a very rare disease, requires both parents to have a recessive gene, accounting for about 1 in 5000 with European descent. 11. Hereditary hemochromatosis—iron deposits in the liver, heart, and pancreas causing damage. These gene variants could be positive and open a host of testing to prove or disprove a disease being present. Since insurance does not cover the genetic testing, the workup may not be either. B. 43 inherited conditions can be tested. These genetic markers (variants) have been linked to recessive disorders. To have these diseases, you must inherit a gene from each parent. Most are very rare, but some of the more well-known diseases include cystic fibrosis, certain anemias (Fanconi, Sickle Cell), certain enzyme diseases (G6PD), and certain sugar diseases. I had to access the UK website to find these actual tests, so if I was interested in having these genetic tests, I would certainly request the exact nature of the current 36 tests. I bring this update to you since I reported on the FDA stopping this website company 2 years ago. Now, the FDA apparently has no choice to approve it, but I could not find how intensive the process of due diligence the FDA went through or it was the lawyers that won out. A recent study followed up on 1042 clients who underwent genomic testing with these online companies. 56% planned on consulting a doctor or counselor. At 6 months after finding the results, 65% had not consulted any doctor or genetic counselor. Of those who did proceed with investigation, only 35% were satisfied with the discussions. If you want to read more information, just search for 23andMe or Pathway Genomics on the web. President Obama’s initiative on Precision Medicine includes $215 million to work on genomics as it applies to chronic disease including cancer. These efforts are nice to see, as it is always a positive to see our government invest in medical research. If you know someone with autism, you may have a feel for this, but this disorder has yet to be defined with a very specific list of signs and symptoms. Medicine tries very hard to pigeon-hole every disease to make it more understandable. I don’t think we can do that with autism. Defining it as a genetic disease is very tempting. But there are various conditions with gene mutations that have autistic signs and symptoms. This clearly is not a one gene disease. Is it even a disease? Autism evolves with age, and is a very dynamic process. Many different diseases of children demonstrate autistic traits. Autistic Spectrum Disorder (ASD) is defined as a spectrum disorder with a group of neurodevelopmental disorders characterized by repetitive and characteristic patterns of behavior and difficulties with socialization and interaction. These signs are present from early childhood and affect daily functioning, according to the National Institutes of Neurological Disorders and Stroke. Asperger’s Syndrome is similar to autism but has significant differences. The diagnosis is made by assessing intellectual disability and language capabilities. Although ASD is more common in males, it affects 1 in 68 children (1 in 42 boys, 1 in 189 girls) today. 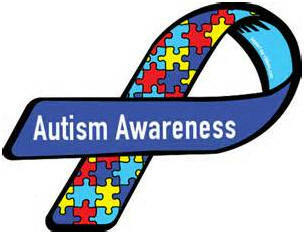 If a sibling has autism, there is a 1 in 4 chance a brother or sister will also be diagnosed. It is more frequently diagnosed in white children, but that may be because studies have shown that the diagnosis in minorities is delayed. Common symptoms in infancy include being overly focusing on objects and lack of eye contact with humans, rocking or spinning, delay in speech, repeating phases over and over (echolalia), and getting upset by minor change. In the first year, a child should be able to turn toward their mother’s voice, respond to their name, babble and point, and respond to social cues with smiling or responding. There is lack of babbling with the parents and interacting in play. In the second year, signs of autism include no single words by 16 months, no “pretend games” by 18 months, no two-word phrases by age 2, loss of language skills, and no interest when adults point out objects. Physical symptoms sometime accompany the behavioral abnormalities—digestive symptoms (30%), poor coordination, and one third have seizures. It is recommended that all children be screened for ASD at 18 and 24 months, and as needed if children have worrisome behaviors or a family history. 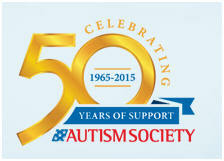 Currently, only 43% of kids 3 years of age are being screened for ASD. Other children with ASD may appear normal until age 2 or 3, and then begin to withdraw and become indifferent to social engagement. Severity of these signs varies among autistic children. Later, temper tantrums, biting, and self-harm out of frustration from not being able to express themselves can occur. As they slip into adulthood, over half have never had a job. 1 in 5 with autism never learn to speak and another 1 in 5 who begin to speak will lose the ability by age 2 because it doesn’t mean anything to them to communicate. Hearing loss, speech difficulties, lead poisoning, and other developmental problems must be ruled out. It is crucial to diagnose autism as early as possible. It is rare to make a positive identification before 18 months of age. The earlier therapists can begin treatment will correlate with better results later in childhood just as most other medical issues. 85% of an infant’s brain cells are set by age 2. Typically, ASD patients are not diagnosed until age 4 or 5. Although this syndrome is similar to autism, there are significant differences. Technically, it is called a pervasive developmental disorder (PDD). 1. Patients do not have low intelligence or language problems usually, but have social issues such as interacting with others and do not adapt to social situations that vary from a routine. 2. Making friends is difficult and they have great difficulty in initiating or maintaining conversation. 3. Repetitive movements are common (finger twisting, hand wringing, etc.). 4. They have unusual preoccupations or rituals (such as dressing in a specific order). 5. Eye contact can be a problem. 6. They have trouble understanding language. 7. They have a limited range of interests. 8. They are frequently uncoordinated and clumsy. 9. They also may be exceptionally talented or skilled especially in math or music. They may have advanced verbal skills. 10. 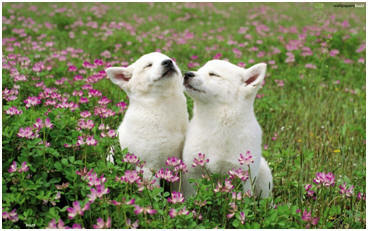 They are usually socially awkward, have trouble understanding nonverbal cues, such as facial expressions. They may focus intensely on one topic that interests them but have trouble making friends or relating to people. Although worldwide, AS is less common than autism, in the U.S. and Canada, as it occurs in 1 in 250-1000 children, and is 4 more times common in males. It is usually diagnosed between the ages of 2-6, when language is noted to be delayed and there are poor communication skills. Treatment includes special education, behavior modification, speech and occupational therapy, social skills therapy with medications only used to treat aspects of behavior present such as ADHD, anxiety, depression, and obsessive-compulsive disorder. There is no magic pill for AS or ASD. Genetics—if another child in the family or a parent has ASD, there is an increased risk. Fragile X syndrome and tuberous sclerosis are examples of genetic medical disorders that increase the risk. Older parents have an increased risk for a child with ASD. A new study links gender dysphoria with Asperger’s syndrome. One clinic (Boston Children’s Hospital) that deals with gender issues found that 23% of their youngsters were diagnosed with Asperger’s. They point out that all transgender patients be screened for Asperger’s. a) Antidepressants taken during the second (not the first), and third trimester doubles the chance of autism. However, depression itself is a risk factor. b) Other medications that increase risk—Valproic acid (Depakene)—used for seizure disorders and thalidomide—(notorious for causing birth defects is now being used to treat cancer, HIV-AIDS, and even leprosy) are known to increase the risk. c) Heavy metals (mercury, nickel, cadmium, etc.) and other environmental toxins such as vinyl chloride (plastics) are suspected but not proven. d) Notice the literature does not consider vaccinations as a risk. Many controlled studies have disproven a link. Behavioral therapies are widely used to help children with ASD to learn to talk and communicate, develop physically, and deal with other people more effectively. These treatments are called Applied Behavior Analysis and encourage positive actions and discourage negative behaviors. Another approach called Floortime, work on emotions and social skills. The TEACCH program uses picture cards and other visual cues. Special services provided by local schools can assist in learning and developing, including speech and occupational therapy. Schools are required to develop an individualized education program (IEP) for each child. There is no medication to treat ASD, however, antipsychotics for serious behavior problems may be prescribed (Risperdal can treat aggression). Anticonvulsants can treat seizures, and antidepressants for depression. Over sensitivity to sounds, touch, taste, or smells, or flashing lights may need attention. Attempts at changing the diet (gluten-free, casein-free), taking vitamin B6 and magnesium have been used, but there is no scientific proof they are valuable. There are some quack methods to steer away from such as chelation therapy. Consult the Autism Society of America about these unorthodox treatments. Patients with Asperger’s Syndrome are often able to attend college and hold jobs. Medical expertise is mandatory, and because this is a spectrum disorder, each child must be individualized after a thorough evaluation including overlapping ADHD and other learning disabilities. The dedication of the parents is mandatory in following through with continuous therapies. References: WebMD has many articles available. 6. New studies question the value of laminectomy plus spinal fusion over laminectomy alone—this could be a game changer!! After the laminectomy and bone pinching the spinal nerves (decompression), plates and screws are placed to the above vertebral body and below to immobilize the spine to prevent motion and further damage to the spinal nerves. 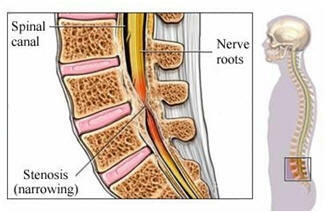 Spinal stenosis implies impingement of vertebral bone on the spinal cord. This can cause sciatica and paralysis if severe. 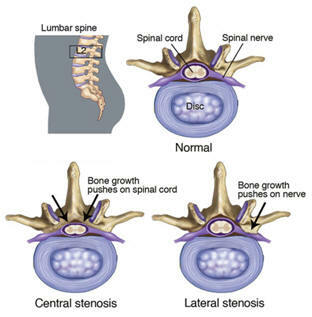 Lumbar spinal stenosis (central or lateral-see above drawing), can cause compression on the spinal cord and or the spinal nerves as they exit through a small canal (foramen) to supply sensation and motion to the leg. It has been the standard of care for most surgeons to perform a laminectomy (removal of the lamina and decompression of spinal nerves, removing boney spurs Reconstruction using a spinal fusion (using screws and plates or rods) then stabilizes the boney vertebrae. It was thought that there would be instability in the vertebrae if a laminectomy was performed, therefore, a fusion was usually recommended. It is much more complicated and requires a longer surgery. The other common vertebral problem is slippage of the vertebrae forward out of place (spondylolisthesis), and in association with pinched nerves necessitates a laminectomy plus fusion. The NEJM in the April, 2016 issue cited 2 studies on these issues from 2 major centers in the Netherlands. 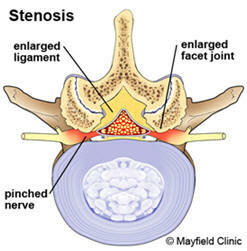 Lumbar spinal stenosis is a very common spinal condition affecting millions of Americans. Lower back surgery is performed on a daily basis throughout the world. Regardless of procedures performed, there is a high rate of revision surgery (even more with laminectomy alone as one might expect because it is very conservative). This condition occurs from degenerative joint-facet arthrosis (inflammation and resulting arthritic spurs) leading to spinal nerve compression resulting in walking disability and leg pain in more elder patients. 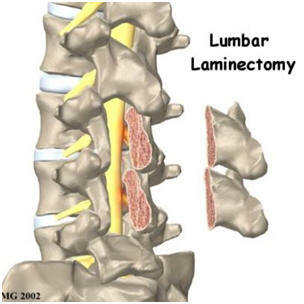 Prior to 2002, laminectomy was not uncommonly performed alone to treat this condition. 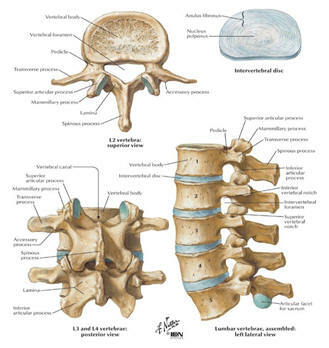 However, since that year, the trend moved to laminectomy (removing the lamina of the vertebrae) plus spinal fusion using hardware to fuse the spine. Screws and plates were necessary to fix the operated vertebrae to the one above it. Bone chips were placed to add to the stability of the metal fusion. In my back, a basket was placed and packed with bone chips. 7 hospitals in the Netherlands performed double blind studies in large numbers to compare laminectomy alone versus laminectomy plus fusion. In both studies, there was little difference in the results of these procedures 2 and 5 years later. They determine results using sophisticated test (Oswesty Disability Index), patient reported outcomes, and a 6 minute walk test. 247 patients were placed in a randomized, controlled study. Half were 50 and half were 80 years old. There was little difference in these groups using laminectomy alone vs. laminectomy and fusion. 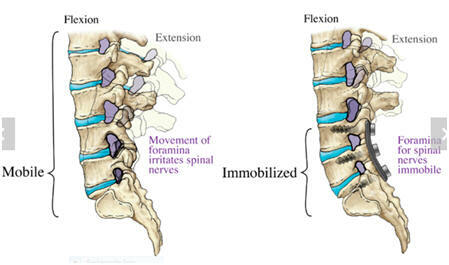 This implies a fusion in certain cases is unnecessary and vertebral stability will occur without a fusion. There are a lot reasons why the simpler procedure would be advantageous. The time to perform procedures is considerably longer when a fusion is included, the hospital stay longer, and the cost much greater. Complications in older patients are a concern as well. Most laminectomies alone in the U.S. are performed as an outpatient or 23 hour admission. 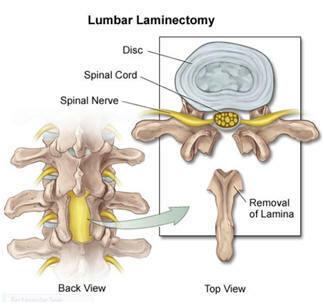 Recovery is quicker and using microscopic technique requires a smaller incision, less bone removal (they don’t remove all of the vertebral lamina). Healing is faster, and there are fewer complications. There is another issue mentioned above…when one vertebra slips off center from the other called spondylolisthesis. This is in addition to lumbar stenosis. This study compared laminectomy alone with laminectomy plus fusion in grade 1 degenerative slippage (milder) spondylolisthesis. If the slippage was more severe (higher grade) or there was instability demonstrated (on X-ray using flexion/extension technique, fusion would clearly be indicated to prevent further slippage. Reoperation with laminectomy alone is higher (34%) compared to 14% for the combo procedure. Revision surgery would require fusion or revised fusion. These new findings require you discussing this with your surgeon, and in my opinion, getting a second opinion. There is a failure rate with both procedures and many factors have to be considered. Take this information to your surgeon and discuss this before accepting surgery that includes laminectomy plus fusion. Time for the procedure, healing, recovery time, complication rate, and cost all need to be considered in lumbar surgery. Of course, surgery is clearly not the first line of defense. Pain management including epidural injections, physical therapy, and medication and spinal manipulation (chiropractic) all should be part of a regimen before surgery should be considered. If these studies hold up over time, spinal lumbar surgery will become simpler without fusion using a simple laminectomy.